Out of deep space, a mysterious alien race known as "The Givers" came to Earth. They gave the human race the greatest technology ever seen—four giant towers known as Ladders that rose 36,000 miles into space. Each tower culminated in a space station that harnessed the energy of the Sun to power the entire planet. As suddenly as the Givers arrived, they vanished, leaving the human race with one solemn instruction: maintain and preserve the Ladders at all costs. Due to the unique alien construction of the Laddertop space stations, however, only a skilled crew of children could perform the maintenance necessary to keep the stations running. 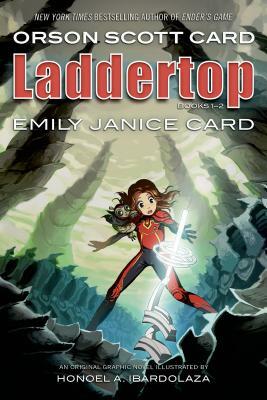 Emily Janice Card has read a number of audiobooks, including Ben Bova's The Aftermath, Orson Scott Card's Ender in Exile, Lisa Gardner's The Neighbor, and several titles by Kimberly Willis Holt. Card is an actor, singer, and writer from North Carolina. On screen, she's appeared in The Delivery. Her stage work includes The Importance of Being Earnest, Bye Bye Birdie, The Fantasticks, and Once Upon a Mattress. She also adapted and starred in the play A Sepulcher of Songs, based on a short story by her father, Orson Scott Card. HONOEL A. IBARDOLAZA is an award-winning illustrator of children’s books and manga, including The Greediest of Rajahs and the Whitest of Clouds. He lives in the Philippines.